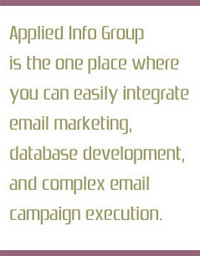 Interested in Learning More About Applied Info Group's Comprehensive Online Marketing Solutions? Now you can access your database, run counts, place orders, check status, and track shipping 24/7 at appliedinfogroup.com. WebOTIS™ offers true multi-tasking functionality on the web. As count requests are submitted, additional queries can be entered while WebOTIS™ runs the original counts. All queries are saved in the system so counts can be rerun without re-entering the information. No matter how many times selects are modified, each version is saved for future reference. Real time counts and virtual counts enable you to run 'what if' scenarios so you get a complete picture of your marketing campaigns. Track all of your campaigns through our online count reports. WebOTIS™ contains an order history console that displays a visual record of all previous counts and orders for each direct marketer. This component helps marketing professionals analyze past campaigns and makes placing future counts and orders easier. (matrix) for any combination of data elements that are selectable in your database. Immediate access to all reports for any order, count, email or merge purge campaign. Every campaign that you have ever run is maintained for your easy access. Develop and run complex list orders and ship them automatically and easily. Manage your campaign for both postal and email applications. Conduct your own email campaigns from our high powered, easy to use delivery system that is integrated with your database.